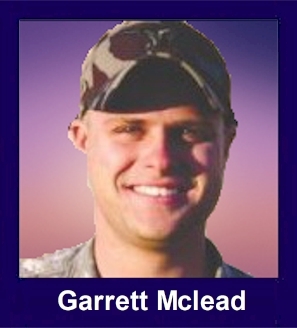 The 35th Infantry Regiment Association salutes our fallen brother, SGT Garrett I. McLead, who died in the service of his country on August 22nd, 2007 in Multaka, Iraq. The cause of death was listed as Helicopter Crash. At the time of his death Garrett was 23 years of age. He was from Rockport, Texas. Hollywood good looks might have gotten him a modeling or acting gig, but ultimately it was the battlefield that called to 23-year-old soldier Garrett McLead, who died Wednesday in Iraq. McLead, a sergeant in the Army's 2nd Battalion, 35th Infantry based at Schofield Barracks, Hawaii, was one of 14 soldiers who died in a Black Hawk helicopter crash during a night mission 180 miles north of Baghdad, near the city of Kirkuk. After the 9/11 terrorist attacks, McLead, who was a senior at Rockport-Fulton High School at the time, was drawn to the military, friends and family said. "He wanted to be an actor, but after 9/11 he changed his plans and went for God and country," McLead's uncle Paul Emmons said Thursday. "We thought he was going to California for modeling and to try his hand at acting." Before he enlisted, McLead talked over his decision with Walter Knight, his pastor at First Baptist Church in Rockport. Knight had known McLead, who he described as "one of those Ralph Lauren-type kids," for nearly a decade. McLead always had a tan and nice hair and he was always dressed sharply. But there was depth with the kid's image. "He joined the Army during the time everyone was feeling real patriotic," Knight said. "He had a real spiritual side and felt it was supposed to be part of his life." The clock was ticking on McLead's second tour of the Middle East. He rotated through Afghanistan during his first tour, and his second tour, in Iraq, was due to end the first part of August when the Army extended it, Emmons said. McLead, a sniper who also did Army reconnaissance work, was 52 days from completing his time in Iraq when he was killed, Emmons said. After the military notified McLead's parents, Patrick and Patty, around noon Wednesday, the news spread quickly through this town of about 7,000. The family, who moved to Aransas Pass within the last couple of years, remains active in the church and gospel singing and owns a hair salon in Rockport. The flags at the city, county and school district were lowered to half-staff Wednesday, where they will remain until after a memorial service, which is not yet scheduled, according to Police Chief Tim Jayroe and Aransas County Judge Burt Mills' office. Patrick and Patty McLead met with Army representatives Thursday afternoon but did not get new information about when their son's body would be returned, Emmons said. McLead was well known when he was in high school. He played soccer, tennis and the saxophone in the high school band and had a tight-knit crew of friends. "A good, all-American kid that you like to have around you," said Aransas County Independent School District superintendent Wayne Johnson, who was principal of the high school when McLead attended. "We have not done anything yet in his memory, but once it is appropriate we will dedicate a tree with a marker." In 2005, McLead's former classmate and fellow soccer player at Rockport-Fulton High School, Matthew Holloway, was killed by a roadside bomb in Iraq. "This is our second one in Iraq," Johnson said. "The impact in small town? It actually makes our community bind together. We begin to respect how fragile life really is and it makes us appreciate one another and take time to say thank you, hello and how are you doing." McLead's friends and family will remember most his sense of humor, his prankster nature and his sense of adventure. "The way he laughs," his cousin and best friend Greg Emmons said, before shakily correcting himself. "The way he laughed. He had an intoxicating laugh." Because of McLead's adventurous nature, he signed up for some pretty risky things in the Army, including sniper school and mountain survival training, Knight said. Knight figured time in the Army would cure him of that wanderlust. Instead, he was surprised when he learned McLead had re-enlisted and was headed for a second tour in the Middle East. "Well, because he had always been such a free spirit," Knight said. "I thought that little stint in the military was all he needed, but I guess not. He grew up and he stayed." Growing up, McLead hung out at lot at his buddy Ted Little's house. When McLead went to the Army, Little, who is about to be deployed to Qatar, went to the Air Force, Little's father Rusty said Thursday. On leave from the Army recently, McLead visited Rusty Little. "I have known the kid since he was little," Little said. "He was proud to be over there, doing what he was doing. Garrett was always a pretty fun kid, but he was pretty serious about what he was doing over there."